"If you love salt and vinegar chips like I do, you will love this healthier alternative! This tangy and salty treat will keep you coming back for more! Perfect as a midday snack. Keep an eye on these, as they can easily burn." Combine chickpeas and vinegar in a saucepan. Bring to a boil. Remove from heat and let stand for 30 minutes. Preheat the oven to 400 degrees F (200 degrees C). Line a roasting pan with foil. Drain chickpeas well, discarding vinegar. Spread on the roasting pan and drizzle with olive oil. Sprinkle salt on top and toss to coat. Roast chickpeas, shaking the pan every 8 to 10 minutes, until they are slightly soft on the inside and crunchy on the outside, about 30 minutes. Transfer to a plate lined with paper towels to absorb excess oil. Serve warm or at room temperature. 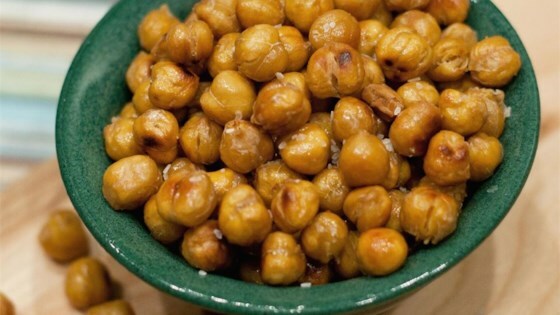 Canned chickpeas are seasoned and roasted to a crispy, crunchy finish. For crunchier chickpeas, roast for an additional 5 to 10 minutes, taking care they don't burn. At 40 minutes, they are crunchy throughout. The longer they roast, the less vinegar flavor will remain, and the harder they get. Nutrition data for this recipe includes the full amount of vinegar. The actual amount of vinegar consumed will vary. youll probably want to double this because they will disapear fast! Nice and tangy and slightly salty. Addictive!!! I didn’t like these. I love salt and vinegar Pringle’s and thought this might help my cravings. I may try to make them again with a different type of vinegar. Interesting recipe. Very good when freshly made. Once cooled not very good. What a great idea. Only change I'd make is use Malt Vinegar with salt, like you do with french fries. Going to give this one a try this weekend.